My home kit, Panini sticker style! Chris and Rich at The Football Attic seem to have captured the imagination of quite a few football bloggers with their exceptional League of Blogs. Further to my initial post on the subject, i thought I'd bring you all up to speed on the success of the project and how it grows in size almost weekly. 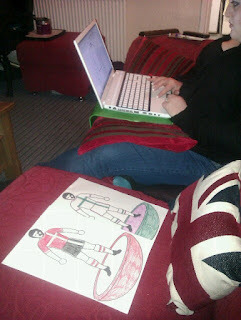 I'm not alone in blogging about my efforts to design a football kit representing the blog and highlighting our artistic tools of choice, in my case coloured pencils. Glitter pens are by far and away the most juvenile (except perhaps for sticking lumps of play doh on your picture), yet brilliant of ideas. 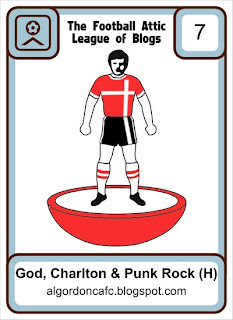 Spirit of Mirko has used this medium to its full potential, you really couldn't get a further extreme to the photoshop world of today and, in fact, further from the actual finished wallchart the kit appears on. Another blog to write of their creation is Narrow The Angle who went for the wonderful idea of shirt sponsor, badge and even kit manufacturer logo. Some people have computer skills i can only dream of! We are now also blessed with a little more Charlton content in the league as Marco, the Charlton Casual himself, has designed both a home and away kit. His boyhood hero Roy Race can certainly lay claim to having influenced this design! Strength in numbers, well, we've dominated one league already this season! As i said before, the league keeps expanding with there now being 92 spaces, one for each league club in effect. At the time of writing, i believe there are only fifteen spaces left. If, in reading this, you fancy a go you had better be quick! Thanks for this post. It Very nice article. It was a very good article. I like it. Thanks for sharing knowledge. Ask you to share good article again. Anyone seen the key to the trophy cabinet?